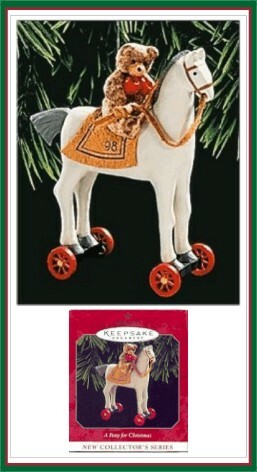 First (1st) in the Pony for Christmas series, this ornament is handcrafted and dated 1998. Sculpted by Linda Sickman. QX6316. In the days gone by, talented craftsmen lovingly created riding toys to delight young children. Then, with the help from jolly St. Nick and the rich imagination of children, the dream of receiving a pony for Christmas would come true. This series of Keepsake Ornaments, inspired by those carefully crafted antique riding toys, features a different style of horse and a variety of attachments each year. This year, the horse has a real leather blanket and reins and carries a confident teddy bear rider.